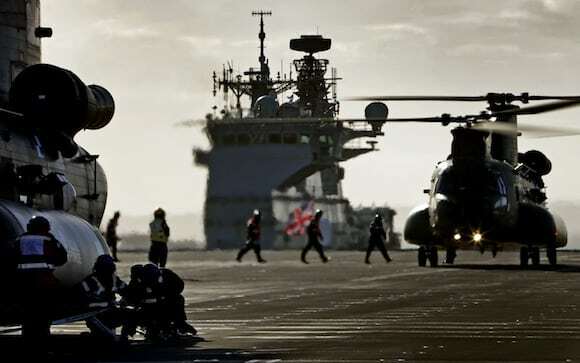 The U.K. Royal Navy’s HMS Queen Elizabeth aircraft carrier returned home last month following the completion of combined flight trials in the Atlantic — featuring the AW101 Merlin and the Boeing Chinook. Conducted under a partnership between QinetiQ and the Air Warfare Center, the combined flight trials were conducted for the first time under a cost-saving agreement negotiated between QinetiQ and the U.K. Ministry of Defense (MOD). The Merlin trial was originally contracted in April 2016, with the Chinook added to the existing agreement at the end of 2017 under a new contract amendment. According to QinetiQ, combined flight trials helped to avoid a a second voyage out to sea later in the year. The initiative will ultimately expedite the release of the carrier into service, QinetiQ said. “These deck trials have been among the biggest ever conducted, and mark an important step toward enabling the carrier’s rotary-wing capability, ahead of the F-35 trials planned later in 2018,” said John Anderson, managing director of air and space for QinetiQ.